Saturday morning I woke up at 3am in my hotel room to the sound of rain beating a pipe outside my hotel room. "Wow," I thought to myself, "If this keeps up, there's no way we can watch prairie chickens this morning." I then rolled over and went to back to sleep. Our plan had been to get up early and have breakfast, go to watch prairie chickens dance, meet Paul Johnsgard, confiscate Paul for a day of birding and then go watch cranes fly in during the evening on a friend's private property. At 5:30 am it was still pouring raing and the weather forecast was bleak with a 90% chance of rain all day until 10pm. During breakfast Stan and I weighed our options. Stay and risk staying in the hotel all day or heading home. We opted for heading home. We did have time to stop at Crane Meadows to meet Paul. Here are Stan and Paul meeting for the first time. 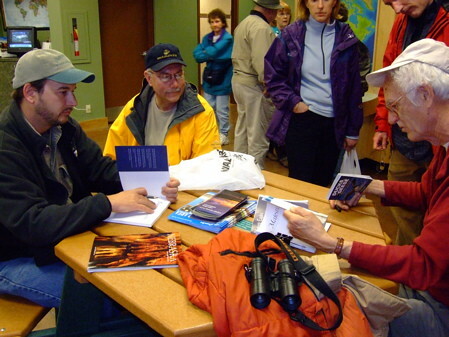 I was anxious for this to happen, I think both of them are the only two guys alive who have written the most books on natural history in North America. And keeping with the glamour classification of the blog, I had to make sure to get in the middle and get my photo taken with Paul and Stan. 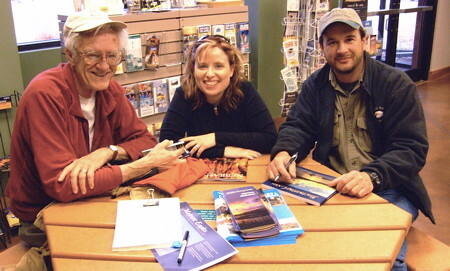 Me sandwiched between two bird authors--my idea of heaven. I have said it before and I'll say it again, I love Paul Johnsgard. He was a tad under the weather and yet was happy to autograph books and answer questions from our group. Paul is a great public speaker, but I find I learn the most when just listening to him talk as he is sketching. Both Paul and Stan influence people with their writing. Stan's books get new people and kids excited about learning to identify birds, mammals and trees and Paul uses his books to educate people about the conservation of the prairie. I was honored to be the one introducing the two. On the way home, I discovered a new use for my birdJam and iMainGo speaker: playing calls and having the group try to identify them. The speaker is loud out in the wild, but in a large vehicle, it was harder to hear it, I had to pass the speaker around for the group to hear the calls. It was still a good time. 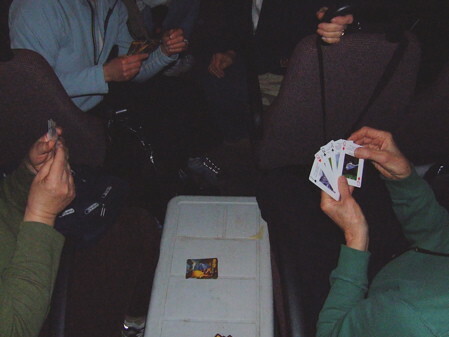 I also rediscovered my love of the game euchre. We played for several miles and reminded me that I need to find some people to play with more often.